This is the third in a series of articles covering “unpopular” larger companies. Benjamin Graham believed that such companies may present opportunities for enterprising investors. We discussed the Graham approach in more detail in a recent article. As we discussed in our recent article on National Oilwell Varco, the financial markets have been reacting to the Deepwater Horizon disaster by punishing the stock prices of nearly every company associated with oil and gas exploration in the Gulf of Mexico. In certain cases, the market reaction may be justified by deteriorating fundamentals and in other cases, stocks may be under pressure based on confusion, uncertainty, or merely “guilt by association”. The current situation in the Gulf of Mexico is a national disaster but is it reasonable to believe that this rich domestic source of oil and gas will not be tapped in the future? The job of the value investor is to look at these types of situations as opportunities and to identify cases where Mr. Market may have overreacted. In this article, we will profile Noble Corporation, a company that provides offshore contract drilling, engineering, and production management services to the oil and gas industry. Noble’s current fleet includes 62 mobile offshore drilling units comprised of 43 jackups, 13 semisubmersibles, 2 submersibles, and 4 drillships. The company currently has six semisubmersible rigs operating in deepwater locations of the Gulf of Mexico with aggregate contracted dayrates of approximately $2.7 million. Semisubmersible Platforms are floating platforms which can be submerged so that a portion of the hull is below water during drilling operations. The platforms maintain their position over the well either through a fixed mooring system or a dynamic positioning system controlled by computers. Typically, these platforms require at least 200 feet of water depth and are capable of drilling in depths of up to 12,000 feet. Semisubmersibles are used for Noble’s deepwater drilling activities in the Gulf of Mexico and elsewhere. 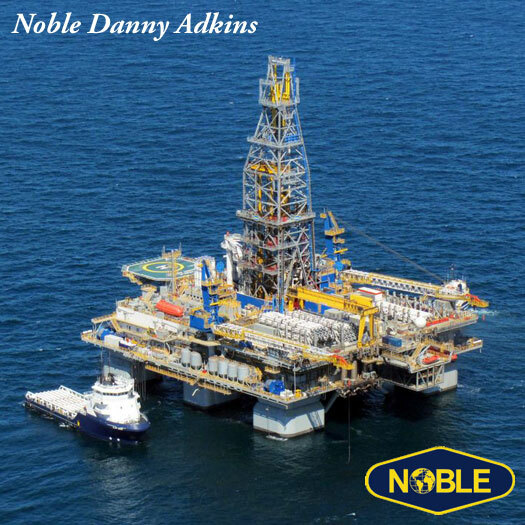 The nearby picture is the Noble Danny Adkins which is currently deployed in over 9,600 feet of water in the Gulf of Mexico. Submersible Platforms are designed to be submerged to the drilling position by flooding the hull until it rests on the sea floor while the upper deck remains above water. These rigs are used in shallow water between 12 and 70 feet. Jackup Rigs are self-elevating drilling platforms equipped with legs that are lowered to the ocean floor in order to establish a foundation for support. The rigs are towed to the location of the well where the legs are lowered based on various techniques. Jackups can be used in water depths from 8 to 400 feet. Drillships are self propelled ships equipped for drilling and are positioned over a well using a dynamic computer controlled positioning system. Noble’s fleet of drillships can be used in deep water areas although none are deployed in the Gulf of Mexico. The following exhibit shows Noble’s current Gulf of Mexico fleet of six semisubmersible units. The data sources for the exhibit are Noble’s Fleet Status Report (pdf) dated May 24, 2010 and the Minerals Management Service (MMS) Deepwater Production Summary Report (pdf) dated June 1, 2010. The exhibit shows the operator, or lessee, of the rig along with the contracted average dayrate and the contract expiration. All six of these rigs appear to be operating in waters that are deep enough to be included in the recent six month moratorium on deepwater drilling. The government has mandated a halt to drilling as soon as wells can be placed in a state that is considered safe but it is likely that all of these rigs will soon be idle. Noble’s contracted drilling backlog, as reported in the company’s latest 10-Q filing, are subject to various termination and modification provisions but the company does not specifically list the termination rights of the operators of the Gulf of Mexico rigs. In a worst case scenario in which all six of the currently contracted rigs stop producing revenue, the company’s exposure is roughly $2.7 million of lost revenue per day. However, it is likely that much or all of the cost of the idle rigs through the end of the contracted term will end up the responsibility of the operator rather than Noble. Obviously, beyond the current contracted terms, Noble would not be able to deploy these rigs in deepwater within the U.S. Gulf of Mexico if the moratorium is extended beyond six months. Under such circumstances, the company would either have to idle the rigs, move them to shallow water Gulf of Mexico locations, or use them elsewhere (possibly in Gulf waters under Mexican jurisdiction). One of the important points to note is that the company has a relatively low level of long term debt as a percentage of overall capital deployed. Noble is a capital intensive business but management has not relied excessively on debt to finance capital expenditures. We can also see steady progress in earnings per share over the past few years along with higher margins and return on equity. Much of the progress in recent years is associated with the impact that higher oil and natural gas prices have had on the exploration plans of oil majors and independent exploration companies. The company has been generating significant free cash flow with increases in each of the past five years. This cash flow has been deployed mostly toward expansion of the fleet (newbuilds) or enhancements to the existing fleet. For a company with a current market capitalization of approximately $7 billion, this cash flow track record is clearly impressive. At 22.3 percent of revenues for 2009, the United States is clearly an important market for Noble. Furthermore, based on the type of rigs involved, the bulk of this revenue is associated with deep water drilling activities. Based on a $2.7 million aggregate dayrate, the company could be expected to produce nearly $1 billion in revenue assuming that each rig earns revenue without any interruption at currently contracted rates. 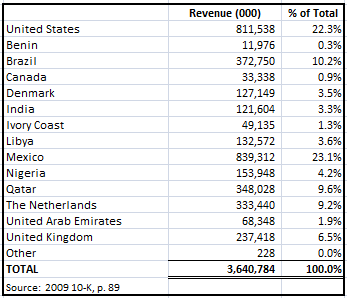 On the other hand, it is also clear that Noble has a large amount of revenue originating in a diversified list of countries, including Mexico which was the largest source of 2009 revenues. It is not unreasonable to believe that many of the rigs currently operating in United States Gulf of Mexico waters could be put to good use nearby in Mexican Gulf waters in the unlikely event that the moratorium extends for several years. In addition, we should remember that, with the exception of Noble Paul Romano facing a near term contract expiration next month, current contracts in the United States Gulf of Mexico do not expire until March 2011, unless contract cancellation provisions allow customers an early exit. While the current outrage over the Deepwater Horizon disaster is a natural reaction, a permanent end to deepwater drilling in the Gulf of Mexico is neither reasonable nor likely based on current production statistics. According to MMS, deepwater production in Gulf has steadily increased over the past 25 years and now exceeds 80 percent of production on the outer continental shelf. Based on the MMS data, deepwater drilling produced 569 million barrels of oil in the Gulf in 2009 alone. According to the U.S. Energy Information Administration, total production of crude oil in the United States for 2009 was 1.9 billion barrels, which means that nearly 30 percent of production can be attributed to deepwater Gulf of Mexico drilling. The United States consumed 6.8 billion barrels of oil in 2009, the vast majority attributed to imports. Is it reasonable to believe that the United States government will prohibit oil exploration and production from a source that provides nearly 30 percent of domestic oil production and represents the best area for new discoveries going forward? Does it represent good public policy to reduce domestic production even though the United States must import billions of barrels of oil each year from foreign countries, many of which are in regions hostile to American interests? The much more likely long term scenario is that governments will impose tougher regulation that impacts oil exploration and production based on lessons learned from the current disaster. There is clearly a risk that government regulatory overreach will cripple deepwater production over a longer period of time. There is also a risk that other countries could adopt such policies as well. However, such risks seem remote given the fact that the modern economy still requires oil to function and alternative energy sources will not make a dent in overall demand for many decades to come. Noble Corporation appears to be in a well diversified position from a geographic standpoint and has delivered solid financial results with minimal leverage in recent years. 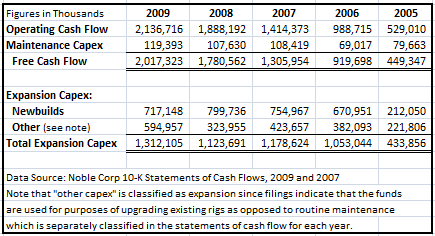 Free cash flow is impressive relative to the current market capitalization of the company which reflects no premium on reported book value as of March 31, 2010. The company should be protected to some extent in the near term by contractual terms associated with the six deepwater Gulf of Mexico rigs. Chairman and CEO David Williams has indicated that all contracts have force majeure clauses but whether these clauses will come into effect is not known at this point. In the long run, it is likely that the United States government will again allow deepwater drilling, albeit with tougher regulation. In the event that an extended moratorium exceeds the lengths of Noble’s current contracts, the company should be able to eventually redeploy assets in other parts of the world. Disclosure: No position in Noble Corporation, but currently considering taking a long position. Updated as of June 3: Long Noble.